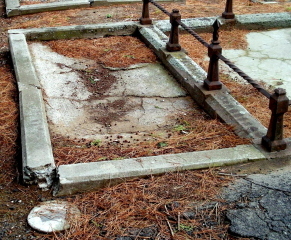 Plain concrete surround; concrete cover cracked; no sign of headstone until replaced by the Friends of Linwood Cemetery in April 2012. 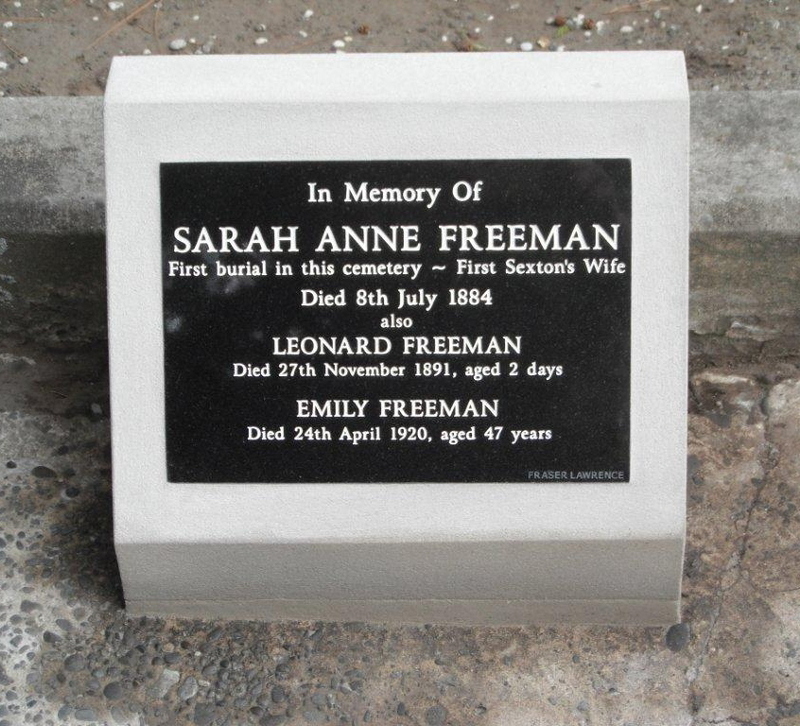 Sarah Anne FREEMAN died on 8 July 1884 of tuberculosis. 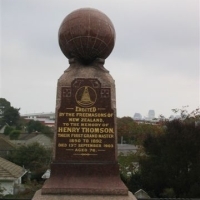 The death warrant was issued on 9th July (Register of Interments, 1884-1885). 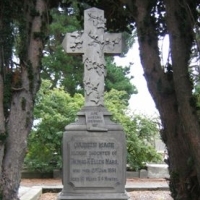 She was the first interment at the cemetery being buried two days later on 10th July 1884 after the initial landscaping was completed but the cemetery was not yet officially open. The plot location is not Block 1 Plot 1 as would be assumed, nevertheless Sarah Ann’s grave is still prominent the otherside of the path at Block 2 Plot 1 and is the first plot you come to at the Hay Street foot entrance. Born Sarah Ann FLUKE, she was the wife of William FREEMAN (B31P90), one of the workers creating the new cemetery. Special permission may have been sought from the Town Clerk City Council for the burial to occur at this time. William FREEMAN had only just been appointed as the first Sexton of Linwood Cemetery. The couple resided in Strickland Street approximately 6 km SW from Linwood Cemetery. The funeral party left the family’s Somerfield home for a 2pm funeral. The undertakers were W. LANGFORDs. 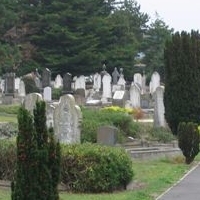 Assuming the layout of the cemetery has not changed, the mourners would most likely have entered the cemetery at the same main entrance on what was then Cemetery Road and walked past the newly build Sexton’s Lodge, which would have been Sarah Ann’s home for some considerable time had she survived. Connection from the City to the Cemetery by Tram was already being considered and the party would have walked along the pathway that became the tramline in under 2 years. The courtege would have carried on through the full length of the cemetery; empty except for its new plantings , ‘up the hill’ past the site of the Kiosk which was already laid out ready to be built, and onto the plot prepared for Sarah Ann. Imagine how Sexton FREEMAN must have felt. In the middle of winter, the first grave being dug being that of your wife. Would he have been so overcome by grief that he wouldn’t have been aware of his surroundings; of burying his wife of about 15 years at his place of work? Or would it have been a matter of pride and honour? Attending the funeral was the Mayor Charles P. HULBERT (B3P2) and the City Councillors no doubt out of respect, but maybe also tinged with the curiosity of a site visit. It wasn’t just the Mayor who was walking past his final resting place but also Councillor James BOWMAN (B28P258), Councillor (and later Mayor) Charles LOUISSON (B16P31), Councillor (and later Mayor) William PRUDHOE (B33P327), Councillor (and later Mayor) James JAMESON (B29P383), Councillor (and next Mayor) Aaron AYERS (B30P85). Buried in the same Plot are Emily FREEMAN (d.1920) and Leonard FREEMAN (d.1891). Emily would have been born circa 1873. She died a spinster at age 47, so could have been a child of William and Sarah’s. Leonard having been born 7 years after Sarah Ann’s death aged 2 days could not have been. From marriage records, Richard GREENAWAY has discovered that William and Sarah also had a daughter Ellen Annie who was born circa 1869 and a son William born circa 1871. They would have been in their early teens when their mother died. From these dates of birth it increases the possibility that Emily was a third child of William and Sarah. Both children married in the Salvation Army Barracks on Fitzgerald Avenue (then East Belt) which could be an indication of the family’s faith. 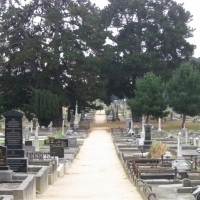 William and Mary FREEMAN and Ellen Annie LEWIS are buried in Bromley Cemetery B31P115 and B31P94. They all died in their late 60s. 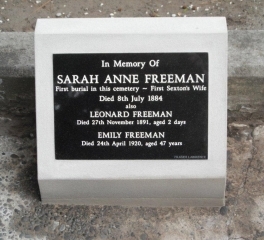 There is a liklihood then that there is line of decendants of Sarah Ann FREEMAN and the Friends look forward to the day they can show them their ancestors graves in Linwood Cemetery and, you never know, see a photograph of Sarah Ann. Compiled by information from reserch by Richard Greenaway and Alexandra Gilbert. With thanks to CCC Archives and Papers Past.